"Gozo/Malta turned out to be the the best option to shoot our commercial. Seeing as crystal clear water and a reliable production set up were the primary challenges for our production we scouted worldwide and ended up in Malta. We are happy with the end result and are looking forward to return soon. " Alexander Blidner, Executive Producer - Com Hem "The Big Blue"
"Shooting in Malta was EASY"
"I want to say Thank You. You did a great job!" "I must say I am so happy with the team you put together for me. I would not say this if it were not true." "My feeling after shooting in the tank is that you have a great operation with a very dedicated and hard working crew that did their very best even during the small hours after hours of work in the tank. Overall I'm impressed by the knowledge and commitment to everything concerning water effects." 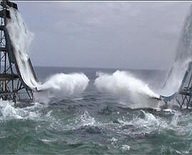 Henry Selder Moore, Director for Volvo - Command the Extreme, referring to water effects created for the first time in Malta on static sets. "Thanks! Great job! It's a great relief to see where we ended up on this one. Thanks again for controlling things so carefully each and every day." "I must say this was the finest shoot I have ever experienced!" "Flying to the Mexico tanks on the border with the US was not necessarily economical and importing technicians from nearby San Francisco would have been more expensive." ​Executive Producer Massimo Martinotti when talking to The Times of Malta during the shooting of the 'Corona - Atlantico' commercial. "Need water? Desert? Seamless horizon pools? Try Malta! Great idea and choice. Though you will have to bring key crew and equipment you will find competent and enthusiastic professionals to fulfill your needs. You'll find that the crew managing the seamless horizon tanks at MFS is very professional and helpful. You will need a local Producer to budget and manage your shoot. If there is someone other than the PCP's Malcolm Scerri-Ferrante, I haven't met him. His knowledge of Malta and his international experience is second to none. From finding the best available local crew to negotiating your hotel rates and foreign lab there is no one better." "Shooting on water is always a difficult proposition but in Malta it becomes a pleasure... production plays god and controls the environment (sea, wind, rain,....) Nice crew, lovely climate, good food." "Our enormous thanks for making a potentially difficult shoot such a smooth-running and enjoyable experience. The crew, locations and facilities you provided on our none-too-generous budget was a revelation. We would whole-heartedly recommend PCP to anyone looking for professional production support in Malta (in fact we already have!)."